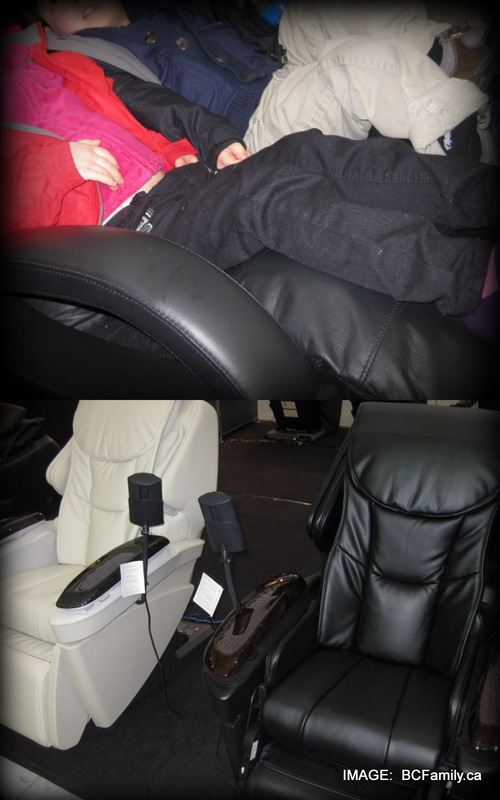 Test driving the Panasonic massage chairs at the BC Home + Garden Show. You can get deep discounts when you purchase one at any of the shows they attend year round. Take one trade show, add in two 3 1/2 year olds and you are bound to end up with an outcome that is different from the pre-show ideals. Going into the BC Home + Garden Show, I wanted to visit every booth, see every event on the stages and sign up for every contest. Naturally our visit did not turn out that way. Here are some of the appealing products and services that we came across a we strolled around with two keen 3 1/2 year olds in tow. If you love natural stone an landscape accents, the catalogue from Northwest Landscape & Stone supply will make you sigh. 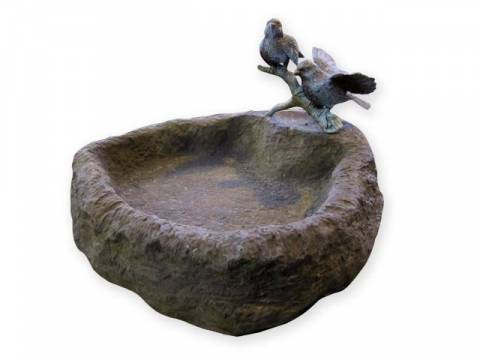 I made a mental note that I’d like stone veneer on our house, natural stone all over our property and stone accents in our garden beds – everywhere. Here’s a tip from a gardening magazine if you don’t have the funds to invest in new stonework. One reader picked up discarded granite sink counter tops from an installation outlet to use for garden pathway stones. Wouldn’t they be slippery? Perhaps, but it makes you wonder what else you can salvage from companies located in industrial parks. In a bag of samples we were given when we arrived (courtesy of the show organizers) we found heirloom Scarlet Runner Bean seeds from Truck Farm. How exciting! We plan to start the seeds in a bag with damp paper towels and then move them to our garden. 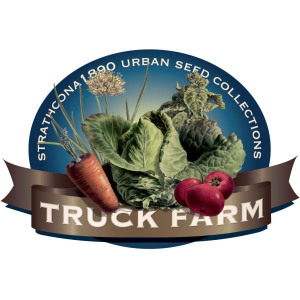 If you are interested to learn more about their unique seed collection, available for purchase online, check out their Strathcona 1890 website. In case you are wondering, there is an actual truck farm. It’s a concept designed to encourage growing food and gardening in urban settings. There are so many talented photographers in the Lower Mainland and British Columbia. We are particularly keen to promote the work of Erich Saide (a popular local photographer) and Anita Alberto (who is active in the Tri-Cities area and beyond). Another studio name that has been showing up in various places online is Images by Bethany. Bethany was on hand for the Family Day at the show along with the Kids Zone sponsor VancouverMom.ca. Local photographers often have season specials and packages. If you think you might like to have photographs taken in the future, make a point of signing up for their newsletter or connect with them via Twitter and/or their Facebook page. When we saw the set-up for Pop-Pop Amusements products in the Kids Zone it was an easy decision to make a purchase. 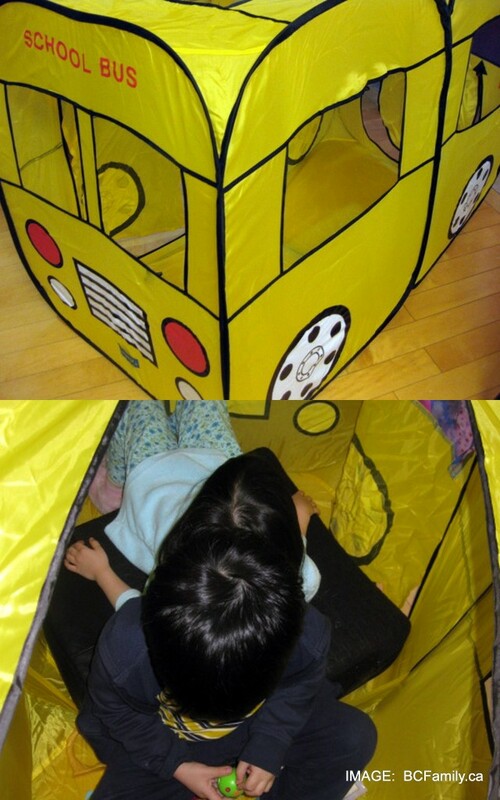 Our three year old son decided that the bus – not the fire truck or larger set of tents – was the must have item. From the moment our children brought the tent home, they’ve been happily engaged in make believe play, as they stock the tent with favourite toys and learn how to make it bigger or smaller. They are both 3 1/2 and can handle the tent without help from adults. The instructions do say that the tents are for 2+ and require adult supervision. The fabric is made or the company in Taiwan and the wiring comes from Japan. The tents also provide sun protection on the beach. We had a chance to try the delicious Milsean butter crunch candy while we were dashing through the show. The Belgian chocolate covered dark, buttery toffee and sliced almonds were high quality, delicious sweets. The next time we’re in Aldergrove, we’ll definitely stop by the Milsean Shoppe to check out their sweets and seasonal gelato offerings. Both Growing Chefs and World in a Garden had booths and made presentations at the show. You can find more about World in a Garden via this BCFamily piece. 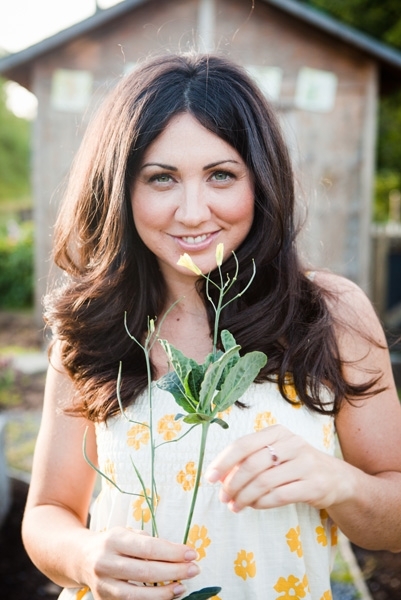 Growing Chef runs a classroom gardening programme in elementary schools and has more information about their programmes on their website. 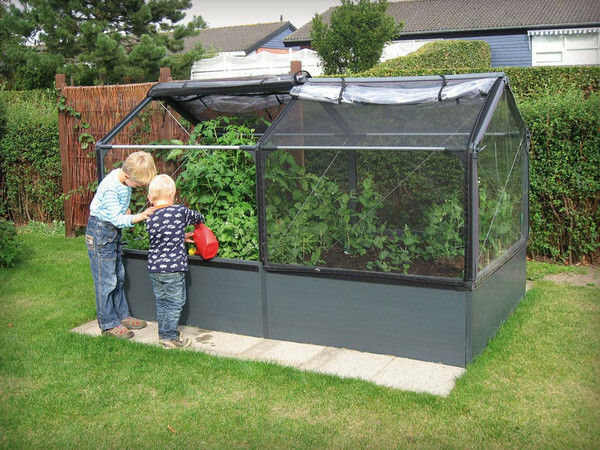 The Made in Denmark Grow Camp raised garden bed and 3′ high greenhouses are dreamy structures that are modular, expandable and include insect netting. They also sell a smaller structure to use with tomatoes. Yes please! 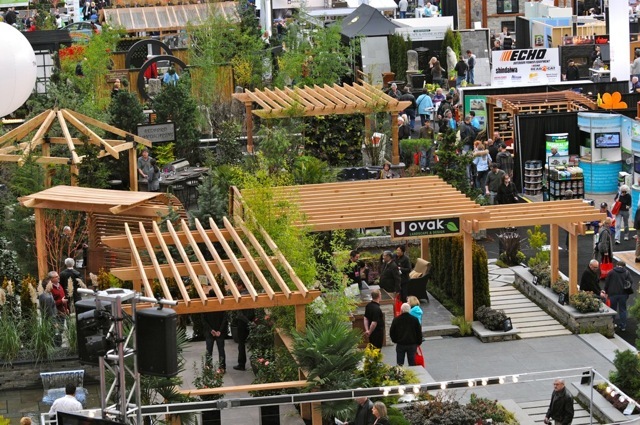 Did you attend the BC Home + Garden Show? Which products or services did you notice? You can comment about this posting using the comment function below or by visiting the BC Family Facebook page. Your opinion matters so don’t be shy! Korena in the Kitchen featured a write-up of the Chicken, Potato and Chickpea Curry recipe that is inspired by the Vij’s chickpea curry that was available in the food court. I love Milsean butter crunch candy. I wish we had them down here! I didn’t notice if they ship to the States but it would be easier if you could just buy them. I want to drop by their store in the summer to add gelato to the offerings we can find and I want to try their cake in a jar too.